“The Vajra Seven-Line Prayer enshrines the most sacred supplication to Guru Padmasambhava. 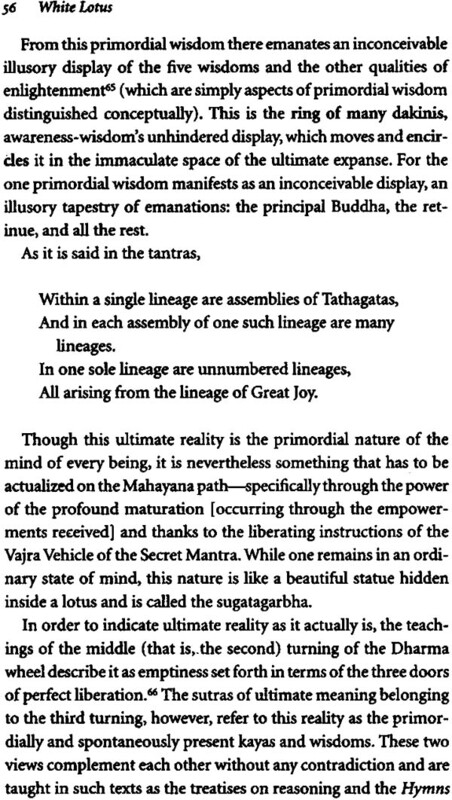 White Lotus elucidates it five layers of meaning as revealed by the eminent scholar Mipham the Great. This is a prayer to and meditation on Guru Padmasambhava, the self-present primordial wisdom of the mind, the changeless great bliss of the vajra-body, the innate radiance of wisdom light-buddhahood. - Tulku Thondup Rinpoche, author of Peaceful Death, Joyful Rebirth and The Healing Power of Mind. “Thanks to the marvelous wisdom and learning of Mipham Rinpoche, we have a commentary that lays before us all the different ways in which the Seven-Line Prayer can be understood. It shows how this precious invocation contains the whole of the Secret Mantra in concentrated form. Regarding the origin of this commentary, Mipham refers in the colophon to an event that triggered the abrupt appearance in his mind of the hidden meaning of the prayer. 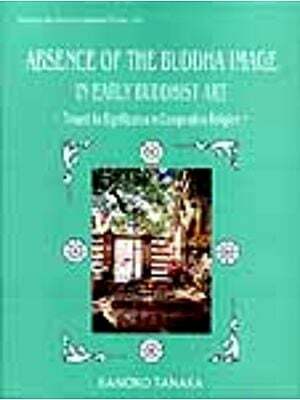 It is interesting to note that the language Mipham uses suggests that the commentary itself is not an ordinary composition but perhaps a treasure teaching, specifically a “mind-treasure,” or gongter. Jamgon Mipham (1846-1912) was one of the great luminaries of Tibetan Buddhism in modern times. He has had a dominant and vitalizing influence on the Nyingma school and beyond. A scholar of outstanding brilliance and versatility, his translated works are eagerly anticipated by English-language readers. The Padmakara Translation Group based in France, has a distinguished reputation for all its translations of Tibetan texts and teaching. Its work has been published in several languages and is renowned for its clear and accurate literary style. The origin of the Buddhist teachings in our world was the Buddha Shakyamuni, who in his unequaled compassion for beings and his wish to bring them all to perfect freedom is praised in the scriptures as a white lotus among the thousand Buddhas of this fortunate kalpa. Before he passed into mahaparinirvana, the Buddha prophesied that his activities would be prolonged and his teachings propagated and protected by Padmasambhava, whom Tibetan Buddhists frequently refer to as Guru Rinpoche, the Precious Master. Invited by the Dharma king Trisongdetsen at the advice of the great abbot Shantarakshita, Guru Rinpoche went to Tibet and spread the teachings there on a vast scale. He made Tibet and the whole of the Himalayan region into a sacred land where the Buddhadharma would prosper even after it had long disappeared in India. Thanks to the power of Guru Rinpoche’s blessings, not only the oral and treasure transmissions of the Nyingmapas but also the teachings and practices of the other schools of Tibetan Buddhism have been able to flourish and have been preserved intact into our time. All of us who have an interest in the Tibetan Buddhist tradition should be keenly aware of the debt we owe to Guru Rinpoche. He is the perfect teacher, the guide for those who wish to progress on the path; and all prayers addressed to him are of immense value. Of these, the most important is surely the Seven-Line Prayer. Not only is it the most powerful of invocations, but its every word is filled with deep meaning. Thanks to the marvelous wisdom and learning of Mipham Rinpoche, we have a commentary that lays before us all the different ways in which the Seven-Line Prayer can be understood. It shows how this precious invocation contains the whole of the Secret Mantra in concentrated form. At whatever stage we are, beginners or otherwise, the Seven-Line Prayer should be our constant companion. It is like a golden key to the treasure house of the teachings. Above all, to recite the Seven-Line Prayer is the best way to invoke Guru Rinpoche so that we can rest in his presence, cultivate devotion toward him, and thus receive his blessings. THE COMMENTARY translated in these pages is unusual and rare. Even within the Nyingma school, it appears to be little known outside the direct teaching lineage of its author, Mipham Rinpoche. We received the transmission and explanation of it in the course of teachings given by Tulku Pema Wangyal Rinpoche, who received it from his father, Kangyur Rinpoche, who in turn received it from Kathok Situ Chokyi Gyatso, one of Mipham’s closest disciples. But if the commentary is a rarity, its subject matter, the seven-line invocation of Guru Padmasambhava, is one of the best-known prayers in the Tibetan Buddhist world. It is treasured and recited wherever the Precious Master, Guru Rinpoche, is revered-especially in the Nyingma school, which traces its origins to the dawn of Buddhism in Tibet. It is the primary supplication of the Guru, regarded, as the embodiment of all refuges, the personification of all enlightened beings, and the exemplar of all subsequent masters and teachers of the tradition. In the Nyingma school, no practice session, no meditation, no sadhana begins without three recitations of the Seven-Line Prayer, and as we can see from the colophon of the present commentary, it is not unusual for practitioners to devote months and even years of their lives to the accumulation of vast numbers of recitations of this prayer. For many Westerners, even those who are attracted to Tibetan Buddhism, Guru Rinpoche must seem a strange and enigmatic figure. As the tantric Buddhist master from Oddiyana (a region perhaps located in what is now Pakistan), who according to the records visited Tibet in the eighth century, there is little prima facie reason for doubting his historicity. And yet the traditional literature concerning him, which includes several full-length biographies, is filled with marvels and miracles of the kind that we would normally associate with legend and myth. Let us briefly review the main points of Guru Rinpoche’s life and his relation-ship with Tibet and its people. According to the annals of Tibetan history, when King Trisong-detsen wished to establish the Buddhist teachings in his country, his first move was to invite to Tibet the great monk and scholar Shantarakshita, the renowned abbot of Nalanda, the vast monastic university that, at that time, was the glory of Buddhist India. Arriving in Tibet, Shantarakshita endeavored to instruct the king and people. He began the construction of the temple at Samye, ordained the first monks, and inaugurated the translation of Buddhist scriptures. His efforts, however, were less than successful. He met with powerful opposition from the Tibetan nobility and royal ministers, whose hearts and vested interests lay with the beliefs and practices of their native religion, the cult of the gods and spirits of Tibet. Intense as their hostility was, however, Shantarakshita sensed that the greatest opposition to his work came not from human agency at all but from the gods themselves. For the latter were disturbed by the presence of the foreign acharya, whose teachings threatened to abolish the blood sacrifices that sustained them and to disrupt the links they enjoyed with the land and its people; and they demonstrated their fury by an unprecedented series of natural disasters. Shantarakshita concluded that the only solution was to deal with the gods directly and to fight magic with magic. Frankly admitting that exploits of this kind were beyond his capacity, he advised the king to seek the protection of Guru Padmasambhava, a master of the Buddhist tantras and a yogi of unobstructed power. The great Guru duly arrived and, in answer to the pleas of the king, transformed Tibet into a Buddhist land. As Shantarakshita had predicted, his first task was to subdue the gods, the strong and arrogant spirits that until then had reigned supreme. Tradition tells of many occasions in different parts of the country when Guru Rinpoche confronted and defeated them, not by destroying or driving them out, but by overwhelming them with his majesty, so that they became meek and submissive to his word. Many, it is said, took refuge in him. They entered the Dharma and became Buddhist. Others, less amenable, were subjugated by his yogic power and bound under oath to protect the Doctrine. Having thus pacified the spirit world, Guru Rinpoche was free to disseminate the Buddhist teachings, especially the Vajrayana, unhindered. And in so doing, it is said that he hallowed the land so completely that not a place remained untouched by his sacred feet, no clod of earth was not saturated with his blessing. This was not the first time that an attempt had been made to effect the conversion of Tibet by occult means. Tibetan literature records that King Songtsen Gampo, several generations before, had constructed a whole network of temples located in places of geomantic significance, the purpose of which was to pin down the unruly country, envisioned as an enormous female figure-the “supine ogress”-stretched out on her back. The texts tell us that, for a time, this method was successful and the Buddhist teachings began to spread and take root. Being widely scattered throughout the land, however, these “border-taming” temples were hard to maintain. And as they fell into disrepair following the death of Songtsen Gampo, Buddhist practice too began to diminish, overtaken by the encroaching shadows of the old ways. As a safeguard against a similar decline, which was liable to occur after his own departure and the later collapse of the royal dynasty, it is said that Guru Rinpoche provided for the future of the country by concealing treasures of teachings to be revealed to future generations by the incarnations of his closest disciples. This treasure, or terma, tradition, which was and remains an important feature of the teachings and practice of the Nyingma school, is one of the most amazing legacies of Guru Rinpoche’s visit to Tibet. It has acted as a protection for the lineages of transmission, on which the practice of the tantras depends, and has been a recurrent means whereby the teachings have been revitalized and refreshed.